Take a look at the north pole of Titan, the largest of Saturn’s 62 known moons, and you will spot something unusual: lakes. Titan is the only other planetary body in our solar system known to have bodies of liquid at its surface. Scientists have dreamed for years of sending another spacecraft through its thick orange atmosphere to get a look. NASA announced Thursday that it has awarded two ideas for exploring Titan with $100,000 each. One plan submitted by NASA’s Jet Propulsion Lab, dubbed the Titan Aerial Daughtercraft, would deploy a small drone to capture images and map the moon’s surface. It would then return to a ship to send the information back to Earth and recharge. 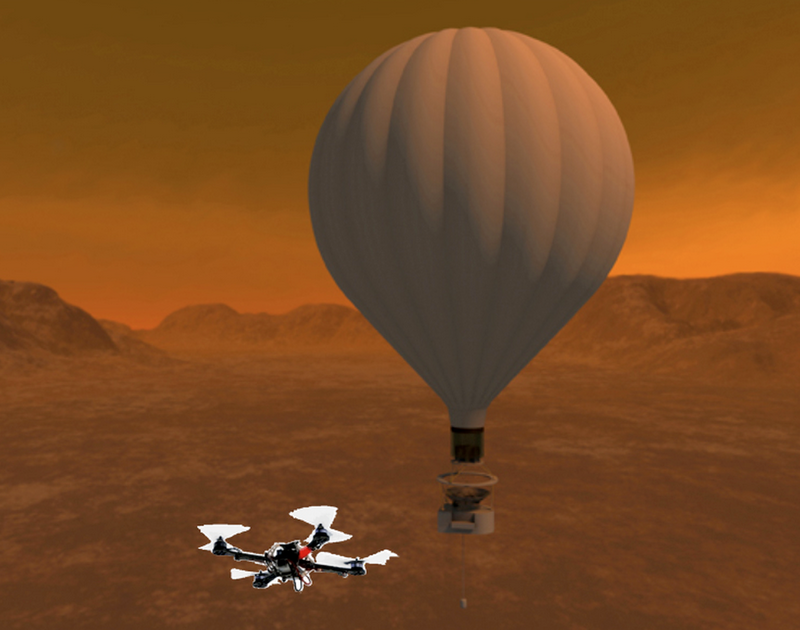 A rendering of a drone above Titan’s surface. The drone could be accompanied by a balloon, where it could dock and recharge. Photo courtesy of Larry Matthies / NASA JPL. A second plan from Glenn Research Center would actually send a submarine to explore the depths of the lakes at the north pole. Specifically, it would dive below the surface of Titan’s largest lake: Kraken Mare, which is more than 600 miles long and nearly 1,000 feet deep. It would complement a separate mission to explore Titan’s surface. Titan fascinates scientists because it shares quite a few characteristics with Earth. While its lakes may be made of liquid ethane, methane and propane, they cycle through Titan’s atmosphere much like water does on Earth. It is the only moon that has a thick atmosphere and its surface is covered largely in ice. It experiences weather patterns much like those on Earth: wind and rain that create a diverse landscape with cliffs, rivers and lakes. Studying its surface and the depths of its seas could give researchers information about the early years of Earth and life itself. The Titan plans are two of 12 selected by NASA as a part of the NASA Innovative Advanced Concepts Program. If they succeed over the next year, they could be awarded with an additional $500,000 for a further two years of research. Hmm no mention of The Huygens Probe which has already been to the surface of Titan, taken pictures on the way down and taken a very detailed pic of the surface once it landed. I added a link in the lead. I was not familiar with the Huygens Probe–interesting. Thinking ahead. I like that. We could probably learn a lot from Titan.